I have a phobia or rather a setback, in that I can't imagine a gravy without onions or tomatoes. when I sat thinking about it, I realized that I do make those gojjus that are typical of Andhra cuisine where either tomatoes are not added or sometimes onions are not added. Apart from that, if I have to come up with ideas for a side dish that's served with rotis, I will end up being clueless. So towards that end, I decided we will have to have a theme, where we cook a gravy without tomato. Or even best a gravy that is normally made with tomato, being cooked without it. Our regular Palak Paneer is always prepared with onions and tomatoes, so when Amma came up with this version that had no tomatoes in it, I had to add it to our menu. We have been making this gravy often recently and I thought it will be best to share with you all. These No Onion, No Garlic Recipes are my regulars as well. I have some No tomato Recipes as well. I need to up my list, so all ideas are welcome! Wash and blanch the greens. In a rolling boil water, soak the greens. 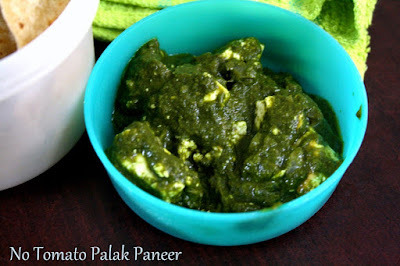 Remove and grind with green chilies to a puree. Heat a non stick pan with oil, saute the onions till brown. Now add the ginger garlic paste and saute well. 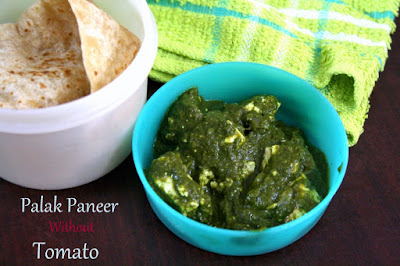 Next add the palak puree along with the spice powders and bring to boil. Add water as required and simmer. Fry the paneer cubes in butter and add along with the butter to the simmering gravy. Cook for 5 to 7 mins and switch off.